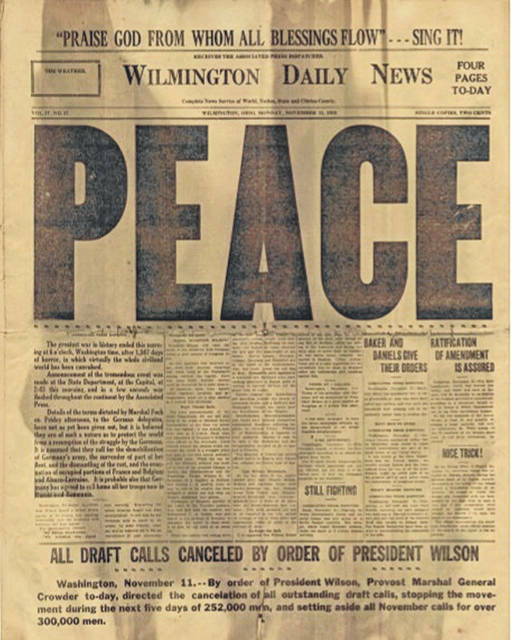 This is the front page of the Nov. 11, 1918 Wilmington Daily News; 100 years later the nation commemorates the end of World War I as well as the beginnings of Veterans Day. For more on Veterans Day locally as well as nationally, see Kelly Hopkins’ column on Page 4. • Show up. Attend a Veterans Day event in your area. Roy Rogers said, “We can’t all be heroes; someone has to sit on the curb and clap as they go by.” Veterans Day is a great opportunity to do just that. Clinton County’s annual ceremony begins at 10:30 a.m. Sunday at the county courthouse square in Wilmington. There’s also a Veterans Tribute concert at the Murphy Theatre at 3 p.m. and the Quaker Heritage Center opens a special exhibit beginning Sunday. More details on these events are in today’s News Journal Community Calendar. • Donate. There are a plethora of wonderful organizations who offer all manner of support, services and appreciation for our service members, including those in Clinton County such as the American Legion and VFW posts in Wilmington and Blanchester, and the Clinton County Veterans Service Commission. • Ask someone about their service. It seems like we all know someone who has served and Veterans Day is a great time to ask them about their service. Some questions to get started are: What did you do in the military? How long did you serve? What was your favorite moment in all your time in the service? Did anyone else in your family serve? Why did you choose to go into the service branch you did? Do not ask if they’ve killed anyone and should your veteran be a combat vet who is either unwilling to share or plainly states what they went through, be supportive without being intrusive. Sometimes you don’t have to say anything, just listen and give them your full attention. • Write. If you know a veteran, write a simple postcard or e-card that recognizes them on Veterans Day. If you don’t know a veteran, look up the closest military installation and send one there. Small acts of recognizing someone’s service, even anonymously, are appreciated. • Don’t confuse Veterans Day with Memorial Day. Veterans Day is a time to thank those who are serving or have served and are still with us. Memorial Day is to reflect and remember those who lost their lives in service to their country. Confusing the two or combining the two diminishes the importance of both. • Visit a VA Hospital. Find out what the policies are at your nearest VA hospital for interacting with patients or volunteering, and spend the day with a veteran. Many VA facilities will have events on Veterans Day or a special lunch you can help prepare. Even if you never interact with a veteran, helping at a facility is a way to give back.